A leader of the Ferrara School of painting from the Renaissance, Dossi is well known for his enigmatic allegorical style. Born Giovanni di Niccoló de Luteri in Tramuschio di Mirandola. Dossi’s father worked as a land agent, or bursar for the Este family, under their court in Ferrara; they would later become Dossi’s patrons. It is said that he trained early on with Lorenzo Costa (1460 – 1535), also of the School of Ferrara painters..
Finding a long-standing patronage under the cultured Este family of Ferrara, including the courts of Duke Alfonso d’Este (1476 – 1534) and his son, Duke Ercole II d’Este (1508 – 1559), Dossi was one of their leading Ferrarese painters. This was among some of the period’s greatest artists, including Raphael (1483 – 1520), Giovanni Bellini (1430 – 1516) and Titian (1485 – 1576). 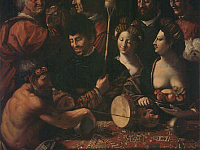 In fact, Dossi’s piece, Aeneas in the Elysian Fields, was part of the Duke’s Camerino d’Alabstro, a canvas piece which also includes works from Titian and Bellini. Dossi also worked alongside artists such as Benevenuto Tisi, called Il Garofalo (1481 – 1559). He often times collaborated with his brother, Battista Dossi (1497 – 1548), who had trained under Raphael in Rome. Part of Dossi’s creative endeavors under Alfonso’s court included elaborate collaborations with the court poet, Ludovico Ariosto (1474 – 1533). While Dossi painted a number of allegorical mythology pieces, frescos and portraits, he is highly regarded for his pastoral landscape works. These pieces were said to carry the influence of the Romantic Venetian landscape painters, like Titian and Giorgione (1477 – 1510). His unusually creative style seen in his mythological pieces carried no less weight in his landscapes, in which he implored an almost magical use of light. His allegorical pieces have been described as “spezzatura”, an Italian term that embodies the art of making great difficulty look easy. This is seen in his unconventional postures and positioning of caricature-like figures in highly complex compositions. A strong example of such work is seen in his 1524 piece, Mythological Scene, which contains thematic elements that still puzzle scholars and critics, now in the J. Paul Getty Museum in Los Angeles. Another of his Mythological pieces, now in the Uffizi Gallery, is Witchcraft, or Allegory of Hercules. His religious based works are equally complex, also in the Uffizi Gallery, The Virgin Appearing to Saints John the Baptist and John the Evangelist. That work was originally painted for the Duomo of Codigoro and accompanies the Uffizi’s other Dossi piece, Rest during the Flight into Egypt and his Portrait of a Warrior. While this last piece may seem a traditional portrait style, the Warrior’s gaze evokes the spezzatura technique, of which is strong within portrait work of artists like Leonardo da Vinci (1452 – 1519). 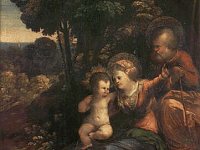 Dossi implored a distinct choice of coloring for his works, emblematic of Titian’s boldness, and suggestive of Correggio’s (1489 – 1534) vivacity. He trained several other painters, including, Giovanni Francesco Surchi, called Il Dielai, Gabrieale Capellini and Jacopo Panicciati. His works are in collections throughout cities such as, Florence, New York, Los Angeles, Dresden and Kraków, among others.